Taking part in a Guided Cavern Tour allows Open Water Divers to venture safely into the openings of the Cave Systems and discover a unique and magical world very few have ever seen. The Cenotes are the windows into an incredible underground aquifer. They provide ideal diving conditions which are unaffected by the weather. 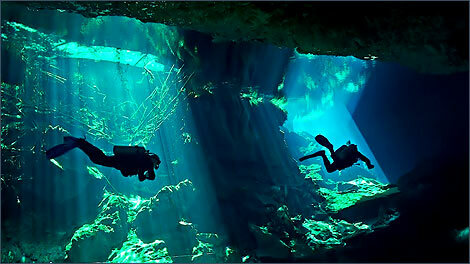 Filled with fresh water the visibility in the Cenotes averages over 100 feet! The minimum water temperature is a fairly constant 77F / 25C and average depths are only 35ft / 10m or shallower. Your tour will be a unique diving experience unlike anything you have done before. Prepare to discover the mysterious Halocline. See the breath taking beauty of the decorations and ambient light effects. Marvel as you glide through what was once living coral reef and ocean floor 65 million years ago and is now part of the underground river system of the Yucatan Peninsula.